This is a game to suit those on a winning streak, looking to top off their golden day at the casino with one last shiny jackpot opportunity. There are no fancy features here, just a good old fashioned 3-Reel, 1 Payline offering where you can go all in and win the huge on-going progressive jackpot. 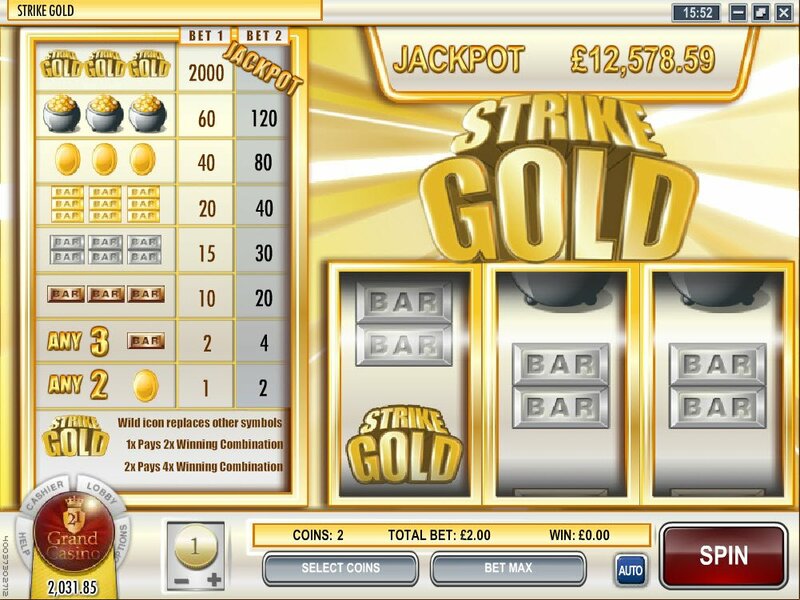 The Strike Gold Slot reviews this progressive jackpot from Rival Gaming. In a simple, old fashioned 3-Reel, 1 payline progressive slot, Rival Gaming have excelled at raising the stakes on striking the gold jackpot here. No frills, no video story, no characters, just the bars of old and gold coins, lots of gold coins. Buckets in fact. The main aim of the game here is to hit that jackpot. All that glitters most certainly is gold. Progressive jackpots are hard to win but, with just the stab of a finger on your keyboard, or a roll of it on your mouse, you might find yourself going home with all the takings for that day. Who needs complicated bonus features? Are there free spins and symbols floating around, along with scatter symbols? No. 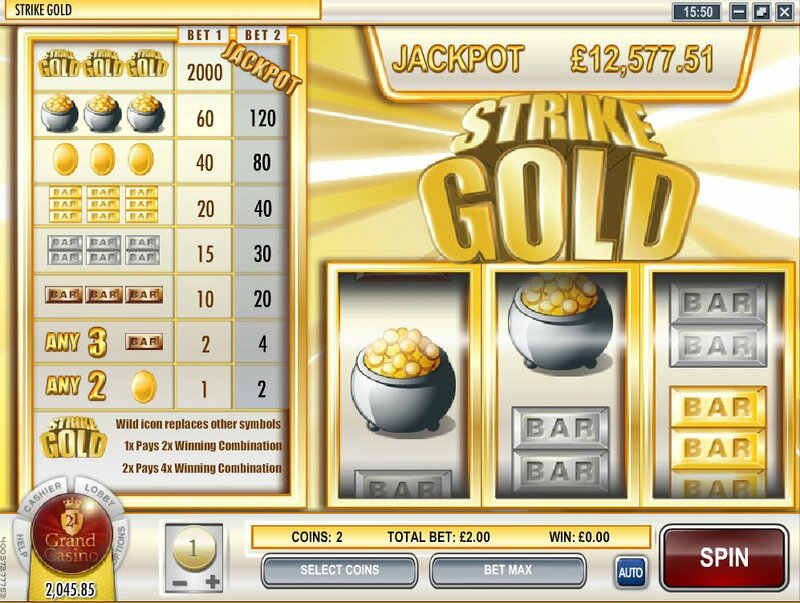 In this slot Strike Gold will let you focus on the main thing, our goal - to hit the progressive jackpot and, not just strike gold, but also batter it around a bit until it is in a shape we recognise. The graphics here all centre around gold. Gold in the 3-reels, gold in the name, gold framing our reels and gold in the symbols. All that glitters most certainly is gold. There's a nifty addition of music that will keep your spirits up as you spin the Strike Gold slot reels. It has a jungle type theme, complete with banging drums and swooshes that make me think of a river and climbing further up a mountainside in search of my hearts greatest desire. The coins you will receive for all the bronze and silver prize bars, including the paltry gold coins, are nothing. Even the baskets full of gold coins are only worth between 60 and 120 coins, depending on your total bet amount. 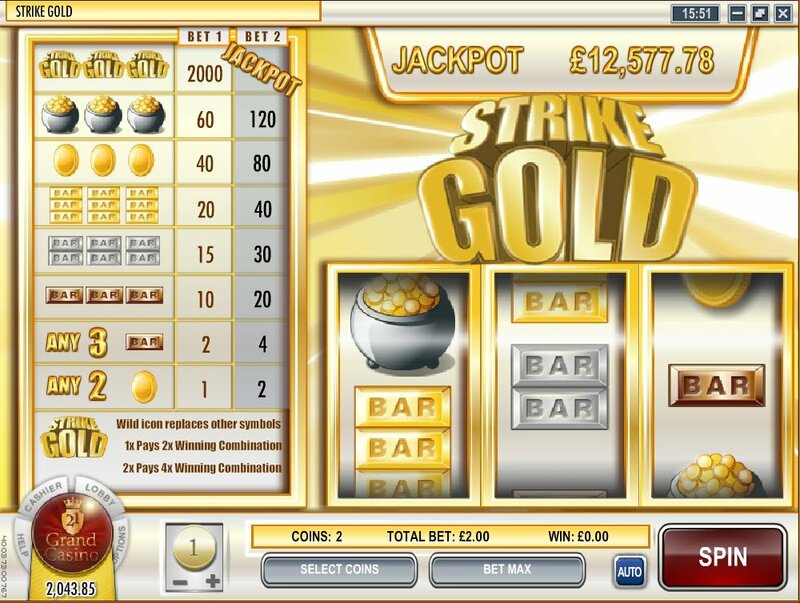 You really wantto be betting at max to hit the jackpot as, otherwise you only have a chance of winning 2000 coins with the golden Strike Gold slot symbols of the amazing progressive jackpot.